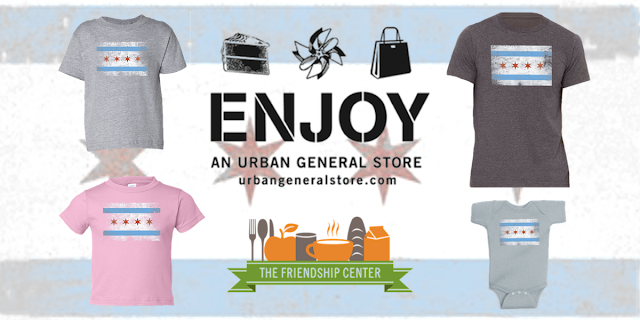 In celebration of #GivingTuesday, ENJOY, AN URBAN GENERAL STORE and Urbangeneralstore.com are donating 10% of the proceeds of the sale of our Chicago Flag T-Shirts, Bibs and Onesies for men, women and children to The Friendship Center in Lincoln Square. Your purchase of the t-shirts and accessories supports their ongoing operations to feed our neighbors in need. The Friendship Center is a 501(c)3 nonprofit organization operating two food pantry locations on the north-side of Chicago. More than 1,400 individuals are served every month. They are supported almost exclusively by donations from individuals and partner organizations. ENJOY, AN URBAN GENERAL STORE located in Chicago’s Lincoln Square Neighborhood at 4723 North Lincoln Avenue, Chicago, IL, 60625 since July 2005. Urban General Store™ is the eCommerce home of ENJOY, AN URBAN GENERAL STORE launched in October 2008 as a specialty online gift store. The concept of an urban general store is a nod to general stores of the past but updated to meet the needs of today's modern shopper. The site carries a wide variety of fun, functional, inspirational and well-designed items so that all your gift buying can be accomplished at one website.